For those of you who thought Cannon Films were just action film specialist back in the 80's, look no further then the sci-fi/horror oddity that is Lifeforce. Directed by Tobe Hooper (The Texas Chainsaw Massacre, Funhouse, Poltergeist) and penned by the late Dan O' Bannon (Alien, Return of the Living Dead), this cluster of space-vampire wackiness has just made it to Blu-ray and DVD via the folks at Scream Factory in a special edition that could "breathe" some new life into this underrated space fright flick. When a group of astronauts attempt to explore "Halley's Comet", they instead find something way more interesting - naked people encased in glass floating. Sounds like fun, but the expedition unfortunately ends poorly for the crew and our seemingly harmless nudists become a threat to earth as they are pent on sucking the life out of humans and taking earth for themselves. The stunning Mathilda May plays the lead space vampire who seduces literally any man in her path after she escapes a laboratory. Tom Carlsen (Steve Railsback, Turkey Shoot, and The Stuntman) is the only remaining survivor of the deadly space mission and is determined, along with the help of Colonel Caine (Peter Firth) to track down this unstoppable succubus. It's not especially easy for Carlsen, as he can sense her presence and is still vulnerable to her powers. Railsback always seems to play quality crazy people, here it's slightly different because he's the protagonist. Still, he's a joy to watch. Mathilda May naked for 95% of the movie will probably do that to a lot of men. The FX of Lifeforce are absolutely awesome. Seeing these impressive make-up FX put together by Bob Keen (Waxwork, Even Horizon) and Nick Malay come to life kinda had me shed a tear as I thought about the days when everything wasn't CGI and people actually put this kind of effort into their creations. What the space-vampires do to their victims is an especially cool effect. The set designs of space during the opening and London towards the end of Lifeforce also exhibit some striking visuals. 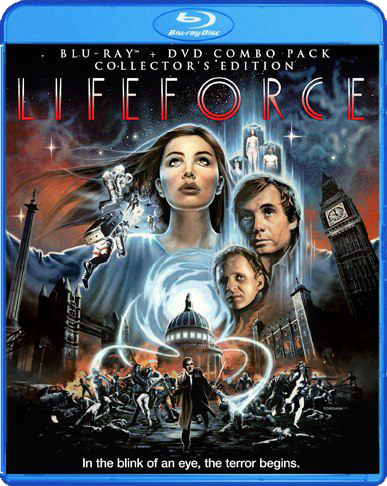 If Lifeforce gets any kind of criticism it wouldn't lie in the look of the film. The script is another story as there were other cooks in the kitchen besides O'Bannon but seen in its original British cut instead of the theatrical (both available in this release), a few of those hole close up. Scream Factory is pretty generous with the extra features on Lifeforce - we get a rare behind the scenes video with Tobe Hooper, an interview with Hooper, one with star Steve Railsback as well as the still very lovely Mathilda May, an audio commentary with FX guru Nick Maley and an audio commentary with Hooper moderated by Tim Sullivan of Bloody, Bloody Bible Camp fame. Sullivan does a nice job fielding questions to Hooper, and comes across as a true fan of the film. Hooper’s relationship with Golan / Globus is gone into detail and even why they chose him over someone like Ridley Scott or James Cameron. It was also kind of interesting to also hear the exhaustive casting process for “Space Girl” and how May was such a trooper on set. 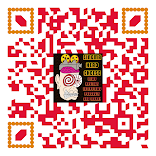 It’s loaded with information and worth a listen. Hooper and Scream Factory apparently worked closely on putting together the restoration for this edition, and it shows. It’s much more colorful than I remembered from previous releases and those curious as to how Henry Mancini’s score sounds will be pleasantly surprised as it is stellar here. Lifeforce is really a whole lot of fun, especially if you don’t take it completely seriously. This Blu-ray / DVD Combo pack release from Scream Factory is sure to please fans of this enjoyable unsung gem.